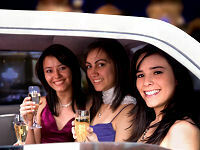 Prom night is one of the most exciting nights of a teenager�s life. Make sure your night is one to remember by letting us take care of all the transportation for you. You can bring along your own music and get the party started as you pull away from your house, and your parents will be assured you will arrive back safely after a fantastic evening. Our 24 Passenger PARTY BUS IS THE ULTIMATE PARTY ON WHEELS, with lots of room to move around and have a great time. We will provide you with sparkling cider to toast yourselves as you are driven in luxury and arrive on time for your dinner reservations and your prom destination. We will do everything we can to help make your prom night the best it can, while at the same time providing a safe environment for your enjoyment. Garlic City Limousine has a strict policy regarding alcohol use by minors under the age of 21, and each minor is required to sign a waiver form explaining the consequences if alcohol is involved during the charter. You can review the waiver in the contract forms section. Prices include all taxes, fuel charges, and driver gratuity; Please check web site before booking for up-to-date pricing. Receive 1 hour FREE when you buy 7 or more hours! The bride and groom will always remember the wild fun they had with special friends at their bachelor or bachelorette party. Our party bus is the ultimate party room! If you are itching to try your luck with the one-armed bandit, or beat the house at table games, we have the perfect package for you! 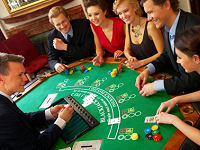 There are many fine casino resorts within a 1 - 2 hour drive from Gilroy and the Bay Area.